The Westwood Coalition held several heavily attended community meetings 2014 about concepts for a “Westwood Square”. Out of that process came recommendations and plans for Gaines Triangle, or what we’ve referred to as the “Bowtie”. The Bowtie is the tip on Town Hall park grounds at Harrison and Epworth Aves and, across the street, Gaines Triangle, the two triangular shapes making up the Bowtie. You can read the Coalition’s full report at and summaries of community meetings here and here and here and here and here or just read through many of the blog posts on the Coalition’s website. You would probably also be interested in the latest architectural drawings and information. Recently, a resident of Urwiler Ave expressed concern about the closing of the little stretch of Urwiler that runs between Harrison Ave and Epworth Ave. It is temporarily closed this summer for Pop! Goes Westwood and is proposed for permanent closure for the expansion of Gaines Triangle. Note that Planning Commission approval for a permanent closing is required. The Planning Commission process is open to the public. Whether or not you can attend the Planning Commission hearing (unscheduled as of this writing), all letters of support and opposition will be presented to the Planning Commission for their consideration. As part of the Urwiler street closure process, letters and post cards were sent to many properties affected by the changes. This detail is provided by the Department of Traffic & Engineering. On the east side of Harrison, all properties received mailings on Montclair and Urwiler from Harrison to Hazelwood. All properties on Epworth also received mailings from Harrison to just north of Montclair, and on the east side of Harrison from Epworth to Montclair. Since Hazelwood and McFarlan residents have alternate routes, they were not considered for the mailings as being “directly impacted”. On the west side of Harrison, all properties received mailings on Urwiler from Boudinot to Harrison, on Stathem from Montana to Harrison, on Junietta from Stathem to Epworth, and on Harrison from Epworth to Stathem. Adjacent corner properties were also included on Montana, Boudinot and Epworth. An initial letter was sent dated November 18, 2015, and a follow-up letter was sent to those that had not responded dated January 20, 2016. The Department of Traffic and Engineering received responses from nearly 50 percent of all addresses after the two mailings. Approximately 80 percent were in favor of the changes on both sides of Urwiler. This overall number in favor of 40 percent is close to that required for street calming, which is essentially the work of the small island. This approval is not high enough for the work on the west side of Harrison, which is a full closure and requires 75 percent approval. In the coordinated report process, only Fire had an objection, and it was related to the full closure on the west side of Harrison. The Fire Department does not object at all to the closing of Urwiler between Epworth and Harrison Aves. You are welcome to comment here (we review comments before posting to filter out spam) or email revitalizewestwood@gmail.com or talk with any representative to the Westwood Coalition. We will announce any future Coalition meetings on our website regarding Gaines Triangle, Town Hall Park Grounds, Planning Commission hearings involving the Bowtie area, and other matters of interest to the Coalition’s work on the revitalization of the business district. Mary Jenkins (Coalition facilitator) and Elizabeth Bartley (WestCURC executive director) gave an hour-long update on Westwood historic business district revitalization for an audience of forty attendees at WUMC on June 30. A Q&A session followed. Developments over the past six months are significant and the plans for the next year will lead to tangible results. Mary Jenkins welcomed attendees and introduced the Westwood Coalition and its members, followed by highlights of the Coalition’s recommendations and work for the benefit of first-time attendees. She then noted that the point of the evening’s meeting was to see forward movement toward the emergence of phase one of a vibrant, thriving neighborhood business district (NBD), thanks to the steps taken in recent months to move forward the community’s vision and preferences for the NBD. She then introduced Elizabeth Bartley who started by emphasizing that WestCURC’s role is to help the neighborhood implement its vision. Her accompanying presentation slides are posted here. Ms. Bartley listed the Westwood Coalition’s recommendations for the Bowtie option. The Bowtie, you’ll recall, seeks to link the point on Town Hall grounds and the triangle at Harrison & Epworth Avenues together (two points or triangles making up the bowtie) in order to create a focal point for the neighborhood, improve pedestrian safety, and improve traffic flow. As the Coalition recommended, the Bowtie is intended as one key element, the center, of revitalizing the business district by tying its landmark buildings, historic character, public spaces, and businesses together. The other primary recommendation of the Coalition is a cohesive look and feel for the NBD to include streetscaping, signage, lighting, and more. Ms. Bartley reminded us of a comment by Kathleen Norris, a speaker at a previous Coalition meeting, cautioning Westwood to focus on one block at a time, one segment of the NBD, because (1) there would never be enough money and energy to do it all at once and (2) success in one segment of the NBD will attract interest and development in the rest of the district. Madcap Puppets has been successful in its fundraising for renovation of the Bell Building. It expects to start construction on mechanical systems this summer and to move its current Glenmore operations into the new building soon with performance space ready in early 2017. Bridgetown Brewing continues to work on the permitting process to bring its Line 21 brewery into the KS Designs building. Muse Café, an initiative by Westwood residents, is developing its plans to open in the NBD later this year. Faces Without Places, a program to help children living with homelessness, opened recently and is generating positive press. The Firehouse is in transition from the City to WestCURC, which will issue a Request for Proposals to prospective family-friendly restaurant tenants. Town Hall: WestCURC is in conversation with the Cincinnati Parks and other city departments about activating the grounds for multiple uses, including its green space, in line with community preferences. A Community Family Arts & Entertainment District was approved by the City on June 24 and goes into effect in late July. This will attract dining establishments interested in lower cost liquor permits. Sontag Cleaners building may not need extensive environmental remediation so redevelopment of that property may be feasible. The presentation shows more cost detail but, in a nutshell, the design development, with completion anticipated by summer 2016, is estimated at $485,000. That covers the design and planning work to get the above projects shovel ready by next fall. The implementation itself (construction and related costs of building) are estimated to cost about $7,554,000. Ms. Bartley noted that the City’s approved budget includes $250,000 for the design development work on the park property at Town Hall. She commented that the City and Westwood are enjoying a positive, outcomes-oriented relationship. Given these expenses, fundraising continues to be a chief priority. WestCURC continues to work cooperatively with the Coalition, business owners, and the other community and regional associations as it seeks to help implement Westwood’s plans. It has established monthly business owners meetings to provide good counsel and to support an expanded sense of community amongst businesses. Q. 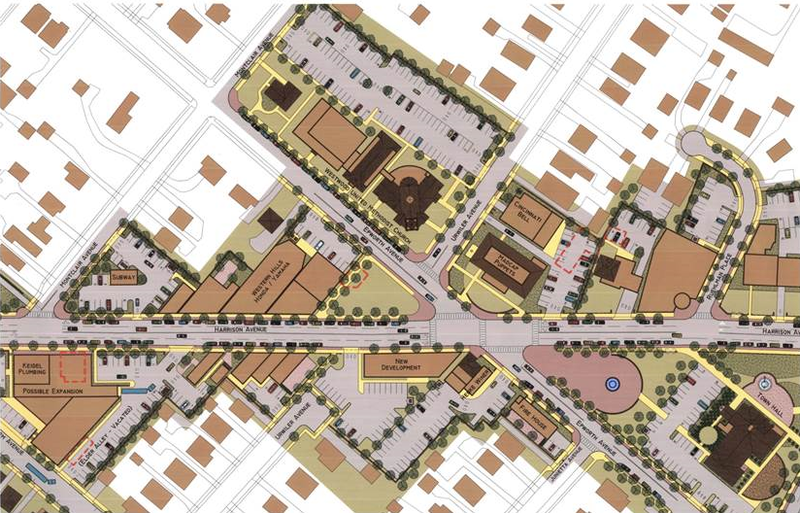 Will Phase 1 include the Triangle at the intersection of Harrison and Epworth? A. The implementation will come later. The basic design has been developed but it will require more specific planning with Traffic & Engineering and others. Q. Does WestCURC still plan to put a pizza restaurant in the former firehouse, in competition with Henke Winery? A. WestCURC will issue an RFP. The pizza restaurant is still a possibility but there may be other proposals. WestCURC will look for a mix of good financials and good fit. While we all hope for complementary products and services in the NBD, some competition is healthy. Q. Has a meeting been held with residents on Junietta Ave about the firehouse? A. WestCURC invited all 22 households to a meeting to discuss its plans and invite input. Eleven households participated. It was a positive meeting with useful input about the desirability of a family-friendly restaurant and other questions and suggestions. Q. Earlier at Coalition meetings, there had been discussion about aging in place and the benefit of planning for this approach, in order to facilitate Westwood residents’ desire to stay in the community. Is anything happening with that? A. Not deliberately at this point, but that is an important consideration and it’s certainly not off the table. WestCURC could offer some housing strategies later on and businesses and programming should consider this demographic. Q. Mayor Cranley mentioned a beer garden and a building on Town Hall grounds last year in his State of the City address. What has come of that? A. While there is still serious consideration to some sort of pavilion on the grounds to support events, it may not take the form of a full-scale building. Q. How were the aforementioned costs calculated? A. Jeff Stine from DOTE addressed this, noting that costs for park development are based on a $40/sq. ft. cost consistent with current parks projects and the streetscaping, demolition, and construction costs are based on $450/linear foot, consistent with current similar projects. City departments and landscape architects have helped with these estimates. Mary Jenkins wrapped up the session by describing two additional developments: First, boards and business owners of Coalition member organizations will gather on July 7 for three purposes: (1) name our missions and priorities, (2) identify particular tasks associated with redevelopment that the community can address over the coming year, and (3) identify the specific people across our community and organizations who would be excellent assets to get those tasks accomplished, by way of recommendations to the Coalition. Second, the Mayor recently announced a proposal for a parks levy. If approved by voters in November, it would include $6M for the redevelopment of the business district, specifically focused on the Town Hall and its grounds and the Bowtie / Triangle at Harrison and Epworth. The Coalition is not taking a position on the levy. It encourages residents to review the details of the proposed levy. Following next week’s Coalition meeting of its member organizations’ leadership, we will post an update. The Westwood Coalition hosted a community meeting on February 18th to share Coalition work of the past few months and to invite perspectives from Westwood Community Urban Redevelopment Corporation’s (WestCURC) executive director Elizabeth Bartley on the work ahead related to the redevelopment of the neighborhood business district (NBD). After welcoming 40+ attendees on a cold night with plenty of competition for their time, Mary Jenkins, the Coalition’s facilitator, reviewed the recommendations that the Coalition made in October, including the adoption of the Triangle/Bowtie option, corollary improvements on Town Hall grounds and throughout the historic business district, and a planning process for the implementation of the improvements. She also highlighted the foundation upon which those recommendations were made: the community process that identified the NBD’s strengths and opportunities, challenges and threats, as well as residents’ goals, such as a walkable, attractive business district, retail shops, a civic or green space, nearby parking, and options for gathering and dining. Next, Ms. Jenkins described an asset mapping process that the Coalition has been conducting, to identify each Coalition member organization’s and businesses’ assets, including personnel, expertise, materials, facilities, constituents, networks, and economic power, all with the intent of connected these assets well to the projects that lie ahead to redevelop the NBD effectively. She described the asset identification as preparatory for achieving the goals set by the community which are big and complex. Then Elizabeth Bartley, WestCURC’s executive director, the chair of this year’s Cincinnati Neighborhood Summit, and a cofounder of a research group on Sustainability, Culture & Place, spoke about the multifaceted, complex process before the Westwood Coalition and WestCURC now. She also noted that the city has held up Westwood’s community engagement process as an excellent example. Ms. Bartley spoke to a number of positive developments in the NBD including businesses at the Ruehlman building as newer anchors, the Line 21 brewery planned for part of the KS Designs building, the WestCURC acquisition of the historic firehouse, Madcap Puppets’ theater plans for the Bell Building, and forward movement on a proposal for a community arts & entertainment district. She also highlighted Westwood Town Hall and its grounds as a locus of activity and a desirable ongoing center of civic and community life, despite recent stints on the chopping block, as evidenced by Mayor Cranley’s suggestions for the grounds during his State of the City address in the fall and by recent programming on the property. She described Town Hall as a destination and part of the vision, not just the backdrop on a postcard of Westwood. Ms. Bartley referred to her effort to understand the means by which to effect change in a NBD, including city processes and engagement with a coalition of city representatives to negotiate and plan. She also mentioned other prospective partnerships and resources like the Port Authority, the Community Building Institute (CBI), the Local Initiatives Support Corporation (LISC), and others, as we seek to grow our expertise and insight. WestCURC is working with CBI to map out steps and identify opportunities as both WestCURC and, more broadly, the Coalition, line up the work plan for the months to come, to tie WestCURC’s work into Coalition plans, and to engage community assets. Next, attendees asked questions and made comments. One attendee mentioned newer businesses as assets, in addition to the landmark buildings and businesses identified by the community earlier. Another person asked about a market study. Ms. Bartley described that as a critical next step to collect data to inform and support development that meshes with community desires and that will be successful and sustainable. An attendee spoke to the value of community education in a civic space. A question was asked about the community entertainment district footprint. The speakers noted that it is proposed as the same as the form based code area in the NBD. Another attendee asked for information about the status of Bridgetown Brewing’s building project. The speakers commented that they seem to be in the building permit phase and directed people to the Facebook page for updates. A participant commented on the perceived need for more parking. Ms. Jenkins noted that current NBD parking lots are generally underused but said that attention to evolving parking needs is necessary and will be addressed, in part, by the traffic flow changes associated with the triangle. An attendee asked about WestCURC’s access to developers. Ms. Bartley and Ms. Jenkins commented on the ways that development will occur: planned development that we would market and recruit, development that happens organically through the interest of property owners and developers, and the development that happens when unexpected opportunities surface. An attendee asked about market constraints or capacity for businesses. Ms. Bartley commented that there is ample room for and interest in business development in the NBD and noted that the market study would help with a more concrete sense of the particular needs and capacity. Lastly, another participant remarked on the changes in progress already, calling it an improvement to the quality of life in Westwood. She asked about the business owners’ perspective on the revitalization plans. Tom Bonhaus, a Coalition member and business owner in the NBD, remarked that the energy is very positive, that there are a few detractors, but that generally, business owners are eager to have more eyes on the street and to see these possibilities and community wishes come to fruition. In closing, Ms. Jenkins and Ms. Bartley described the work phase now as complex, dependent on connections and expertise, and not likely to result in immediate tangible, physical evidence of development. They asked attendees to be encouraged by the work in progress and to offer their expertise, ideas, and contacts to the Coalition and its member organizations. Westwood Town Hall Park Renovation Construction Bid Date Has Been Set! Historic Business District in the news!